New York (TADIAS) — Initially released last November the documentary If Only I Were That Warrior was shown in January 2016 as part of the “Best of African Diaspora International Film Festival” attracting much attention and dialogue among various communities including the Ethiopian and Italian Diaspora. This week, the documentary was also screened as part of the annual Sheba Film Festival in Harlem. 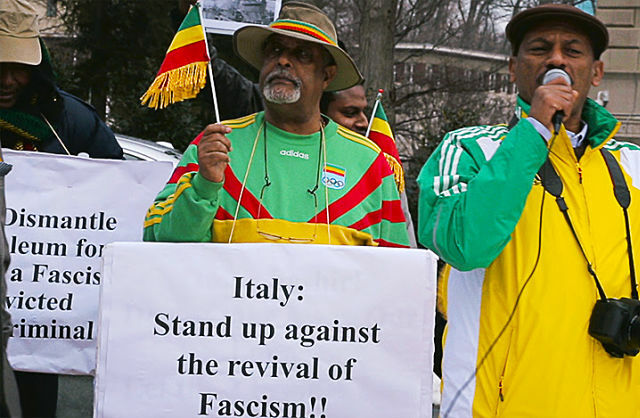 Following the dedication of a memorial to the Fascist General Rodolfo Graziani in the Italian town of Affile in 2012, and the subsequent outrage expressed by Ethiopians during a roundtable entitled “Honoring War Criminals: The Monument to Rodolfo Graziani” held at the Centro Primo Levi in New York, filmmaker and director Valerio Ciriaci decided to challenge the narrative of how Italians — specifically those supporting the right-wing establishment — continue to downplay the brutality of Italy’s colonial history. Filming interactions with residents and leaders of Affile, and including testimonies from Ethiopian elders who witnessed Graziani’s horrific war crimes, as well as the Ethiopian Diaspora’s mobilization against the memorial, Ciriaci weaves together various conversations in an attempt to reconcile viewpoints and memories without compromising the reality of life under Graziani during the occupation. While public funding for Graziani’s memorial was suspended by a new administration in Affile in 2013 the monument still remains standing. Tadias recently interviewed Director Valerio Ciriaci and Producer Isaak Liptzin regarding their journey in the making of If Only I Were That Warrior. The documentary originally included interviews of more than 20 individuals with over 100 hours of footage in Amharic, English and Italian. We asked both the director, Ciriaci, and producer Liptzin to tell us more about what motivated them to document the controversy surrounding the Graziani monument and the dialogues that ensued. Producer Isaak Liptzin noted that the making of the film “was a mix of situations.” After establishing contact with members of the Ethiopian community in New York, Washington D.C. and Dallas, they met Kidane Alemayehu who was leading the anti-monument protest through his organization called Global Alliance for Justice: The Ethiopian Cause. Kidane had also written a letter to Italy’s Foreign Minister regarding the objection against the building of the Graziani memorial. Kidane Alemayehu’s interviews and mobilization efforts were captured in the documentary. “Thanks to Kidane we were able to make some connections in Ethiopia,” adds Liptzin. “It was difficult to find eyewitnesses of the Graziani massacres because it took place so long ago. But we were fortunate to find a monk in Debre Libanos, and that was a very important interview because he is one of the few remaining witnesses to the Debre Libanos massacre.” The monk’s testimony is one of the few ever captured on film.